How to achieve a "Midway" type surprise? Status: offline I was wondering what steps would it take to "surprise" a Jap CV task force in late May 1942? Status: offline The most important factor is luck. Status: offline Luck certainly helps. But, you can increase your odds by doing all you can to shield your CVs from his search aircraft. When you're moving CVs stay far away from his land bases. And, remember that some of his subs have search aircraft so stay away from obvious ports. he won't know where you are (and only a few places where you aren't). In the meantime, you know he's coming at you so you can move your carriers in that direction be it Darwin, Fiji, Midway or where ever you want to try to spring the surprise. At the same time, your own search aircraft should be able to keep the KBs in your sights. The information advantage you can get does not always work, but it does increase the odds. And, since the IJN needs to split up carriers to support as many invasions as possible, you might be able to overwhelm one of his carrier task forces. Status: offline Luck, sheer unadulterated luck! 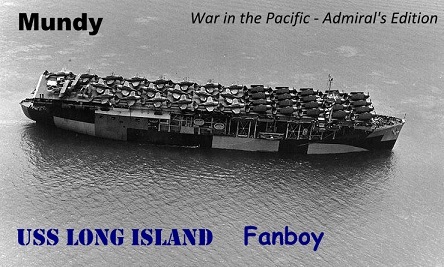 Oh he lost 1 carrier with one badly damaged (if not sunk) and another with a few scratches, while I lost two carriers. Status: offline Getting surprise requires the Japanese player to do things wrong more than it requires you to do things right. This isn't really a factor under your control. I guess "Pick an inexperienced or lazy opponent" could be put on your checklist. Status: offline Weather seems to be a common variable that may result in one-sided exchanges. Granted, that's 'luck' (or selective settings in game options), but it's more specific than general 'luck'. Many examples of one side's fleet being mauled by an opponent that successfully hides in a squall. Status: offline I agree with weather. I agree it depends a bit on the player. You also need a really tempting target. One that is so tempting the Japanese player will stick his neck out for it. Status: offline I'm going to go with luck. Planning helps, recon is a must, but luck is primary. I've played this since WitP, lord knows how many games, I have only had 1 instance where I actually bushwhacked KB. Usually it's the other way around And even my one time cost me an entire convoy of troops & supplies to reinforce Noumea. Status: offline I have done it only once against a real player...in WITP Vanilla. I was a rookie playing against a VERY experienced player , and I think to some degree he badly underestimated me. It was near Noumeau , early in 1942 (I seem to recall May). I had all five CV's there , a lot of LBA , especially PBY's and CV capable aircraft (this was important). Weather was perfect over him , spotty over me , and he had no LBA support. His KB came too close and I got off a perfect "Alpha Strike" , with everyone flying , attacking , and making lots of hits. His CAP devasted my CV air groups , which went ashore , and the USMC CV types came in and mauled what was left. My old PH BB's were docked nearby , and while my CV's refueled and re-armed at a nearby island (where I had stashed my AE's and AO's), my surface ships hunted down and killed survivors. That was the luckiest action I've ever had , and never again had anything approaching it for success. The KB and all escorts , as well as an invasion group behind it were totally and absolutely annihilated, and I had three CV's damaged (which thanks to having AR's nearby , all were saved). We called the game at that point. I'll never see that again. Status: offline Same here. Mine was near Ndini, while I had a major landing there. KB's planes got distracted by all the pretty transports. I lost one carrier and KB got wiped out -- completely. I did lose another CV to a single sub launched torpedo the next day. I think a midget struck a third around that time in harbor, too. will be grounded. A good number of players will put planes on recon from the attack groups that negate this feature. once put some AKL's in front of his TF's and that brought on opinions ..
mechanics .. Trying for a Midway surprise will likely end in disaster .. a la Cuttlefish who really was not looking for trouble .. I am going with this. You know there are no enemy carriers around, expecting limited land based aircraft you set your strike aircraft to Airfield Attack as the Primary Mission. "Carpe diem" - Seize the day! "Carpe Cerevisi" - Seize the beer! Agreed. This is what the IJN did at Midway. In game terms MOST players would play it safe and set NAV as primary and wait until afternoon to strike the base. The IJN struck Midway in the morning, which in game terms means it was the primary attack with NO NAV attack setting. I also tend to agree with Alfred. One needs find an opponent who either doesn't know enough to set NAV as primary with Airfield as secondary or one who is so brash he throws caution to the wind. I was wondering what steps would it take to "surprise" a Jap CV task force in late May 1942? The exact same as at Midway, catching your opponent when he does not expect your carriers to appear, and a significant number of his planes is devoted to other missions than Naval Strike/CAP. I accomplished this in PBEMs twice so far, and was on the receiving end once, in all three cases the surprised carrier force was soundly crushed. Important tips to accomplish this include measuring the range of the enemy's air search and keeping your carriers beyond it until the final rush, and running your carrier groups in a stealth mode, without naval search or ASW patrols from the decks, so that your opponent won't deduce their presence from sudden detection and attacks on his patrolling subs. The Reluctant Admiral mod team. I've done it twice. Once to the Southern Paddler by hitting and sinking two US CVs from extreme range and once against Adm Nelson in the IO. Lost Hiryu and sank 4 American CVs. It ROCKED! So for me at least I get the message 'strike mission cancelled due to weather' for the float planes (if its float planes you're referring to here).